(Newser) – A new study involving pigs and baboons could mean big news for humans downs the road. Researchers successfully implanted pig hearts into baboons, and two of the recipients lived for six months before being euthanized, reports Scientific American. Writing in Nature, the researchers from Germany, Sweden, and Switzerland call the development a "milestone" for cross-species heart transplants, or cardiac xenotransplantation. 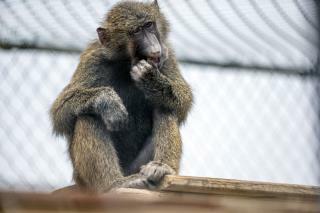 A pig-to-baboon heart transplant had previously worked for 57 days, though that was just in a single case, per the Guardian. The development further raises the possibility that pig hearts could someday work in humans, perhaps putting an end to donor waiting lists, though much research is needed before that could happen. No need... we'll be able to grow replacement HUMAN ones for humans very soon! Who will certify the hearts as kosher/halal? So why euthanize them if they are surviving? What happened?